It's been two weeks and I'm still eyeballs-deep in artwork for Shibe Warz as well as pre-pre-development for our next project that we're primed to start in January 2014. So with this in mind, bear with me that this blog post will be brief and will include (FINALLY) some more much-needed screenshots of what I've been working on in the Art department. Firstly, I'd just like to say that I've never had more respect for animators and, even further behind-the-scenes, animation riggers, than at this point in my life. Animation is a huge deal, and a very huge burden if you're not familiar with the ins-and-outs of its technical mechanics. This is a shot of my Blender window with the main (and regrettably, only) character in Shibe Warz with a weight-painted rig. I'm currently highlighting and moving his left arm into a position for a single keyframe of an Idle animation. I've fallen in love with every single aspect of video game art, and find myself wishing that I'd been dabbling in it for the past ten years (which I will probably forever refer to as my "lost decade"). I have several mountains of knowledge to gain with respect to Art in gaming (and Art in general), but what I've learned through hands-on experience has been exquisite and absolutely invaluable. I highly suggest getting your feet wet and your hands dirty, and downloading the freeware Blender for starters. There are tons and TONS of tutorials on YouTube and BlenderGuru.com for you to peruse at your leisure and learn the ins-and-outs of the Digital Art world. I really do enjoy all aspects of game Art, but before Shibe Warz I never really took any time necessary to fully appreciate how much work goes into character modeling. This character you see here was blocked in very roughly (and with an ultra-low poly-count) in Blender before being exported to the freeware program Sculptris. In Sculptris, I was able to subdivide the polygons on this model several times, giving it tons more polygons and myself the ability to add a lot of detail to the body and musculature. 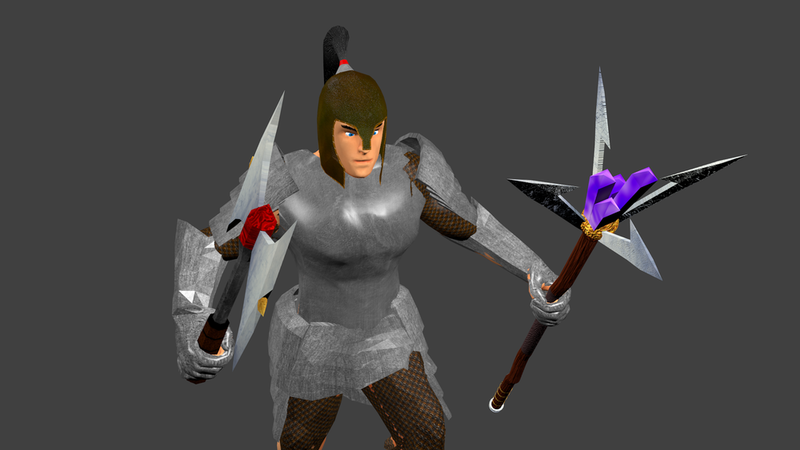 From there I exported it back into Blender and built the armor pieces from scratch around the body, exporting the UV's to the freeware (spot a pattern...?) GIMP and making the textures from scratch. 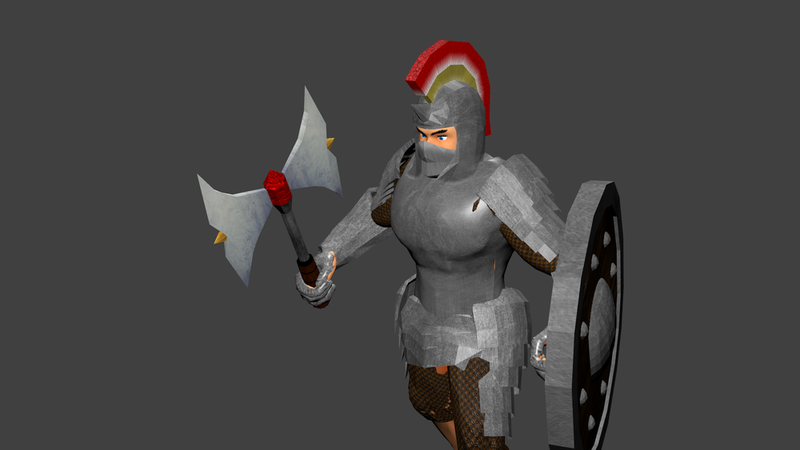 What you see here is the finished Plate Armor set rigged to the original body and ready to be inserted into the game (complete with the Idle animation from the first image above). Over the course of the past two months, I've probably stared at this main character and all of his equipment sets a grand total of 75% of my contributed dev-time. I'm absolutely sick of looking at him, but I regret that a game developer's work is never done. I was fortunate enough to have found an artistic understudy who has taken the time to work at my house every Monday for the past two months. He worked exclusively on the weaponry in the game in order to get his feet wet firstly with Blender and 3D modeling, and secondarily with game development in general. The axe you see in this screenshot is his handywork. You will also notice some artifacts present through the armor. Those will be dealt with summarily, but I must continue to move onto other more pressing things at the moment. This is an example of what you can do with weaponry in Shibe Warz. Each hand is able to hold onto a different weapon, and on your turn each of your characters can use one of their weapons' abilities on the battlefield. The same goes for this picture. A dagger in one hand (which confers X2 damage if attacking an enemy from the rear) and a crossbow in the other (which fires 3 times in one turn at up to 3 different enemies on the battlefield). The armor he's wearing is leather armor, with moderate physical damage mitigation and light movement penalty. You can also mix-n-match helmets and boots between equipment sets. 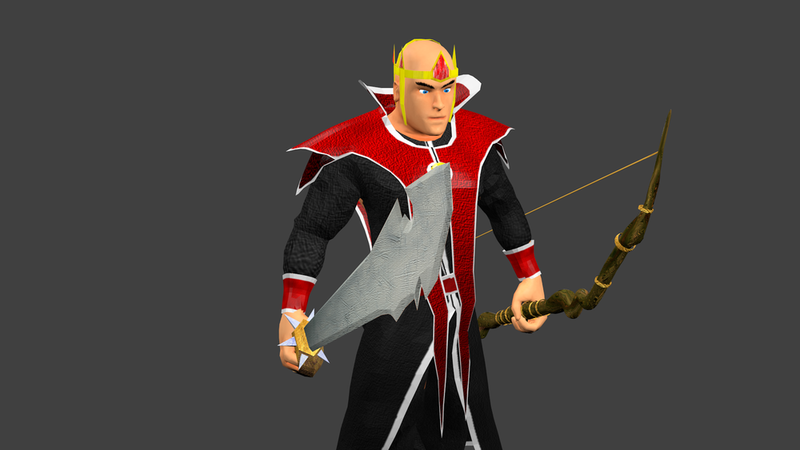 The weapon you see in the character's left hand is the Wizard Staff, which confers huge bonuses to spells cast. 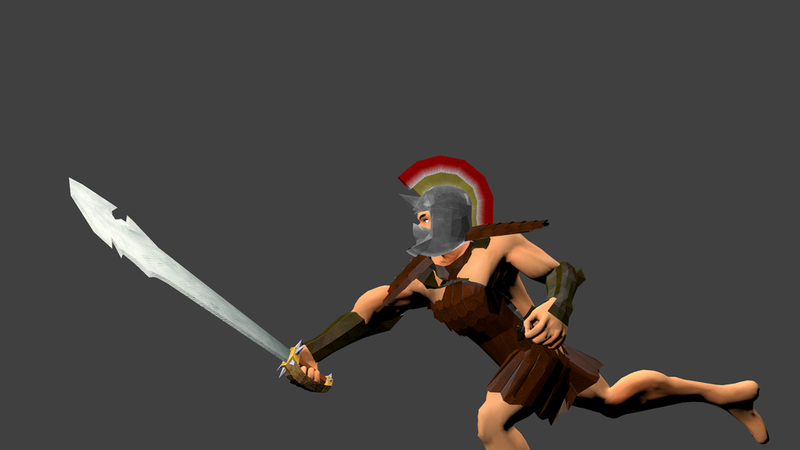 And finally, this is the preliminary animation still for the Longsword swing. I hope this has been somewhat informative for you, and that it's something you can take away and get excited about for the upcoming turn-based tactical strategy game Shibe Warz, coming soon from us at Verus Games. We're very passionate about video games, video game creation, and our players. Stay tuned for more info from us and be sure to check out our other DevBlog articles below, and our Games section up-top to see how far we've come! Thank you for reading, and we hope you have a good holiday if you're celebrating in any way.